Last week we discussed basic Boolean Logic for Marketers. This week we delve into the use of NOT in Marketo. Let’s say you want to focus on a group that did not do something. To be specific, let’s look at people who did not click OR open an email. If that is true, then we will take that group and send them a different email. The first way is to just use the Not filters, excluding anyone with that behavior. Will bring us tens of thousands of leads – because a lot of people never clicked or opened that email. We just want the leads inside that Program. In English class, you were probably scolded for using double negatives because they can be confusing to the reader. 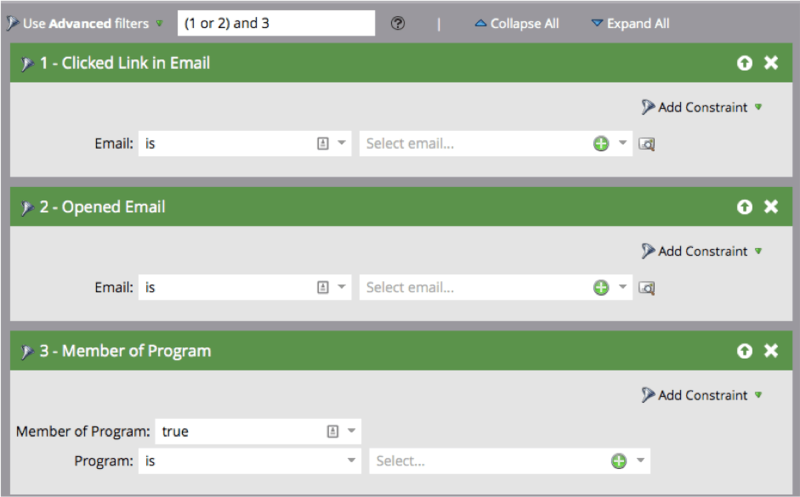 “The same is true in Marketo: it can be confusing to setup a system that says “If someone has not clicked or not opened an email, then do not send email X.” Invariably, these are error prone statements, resulting in incorrect segmentation. Instead, it may make sense to use a positive, inclusive statement to exclude people. It is counterintuitive sounding, but it actually works far better in most cases. This would be true of a trigger campaign. Let’s say you wanted to automatically move a lead from Stream 1 to Stream 2 if they did NOT click OR did NOT Open an email. This way you say that anyone who did not click or open the email 2 days after it was delivered, move to Stream 1, everyone else stay put. If you tried to use a Not filter in a Choice Step, when you wanted to use Not OR Not, then you will cause a misfire. Thus, quite a few folks might trigger Choice 1, but never get to Choice 2. In this situation, a positive smart list with NOT IN will better reflect your intention. This post draws on my webinar, How to be a Marketing Automation Rockstar with my friends at RingLead. Check it out for more helpful tips. Disclosure: Perkuto provided access to a Marketo instance for this post. 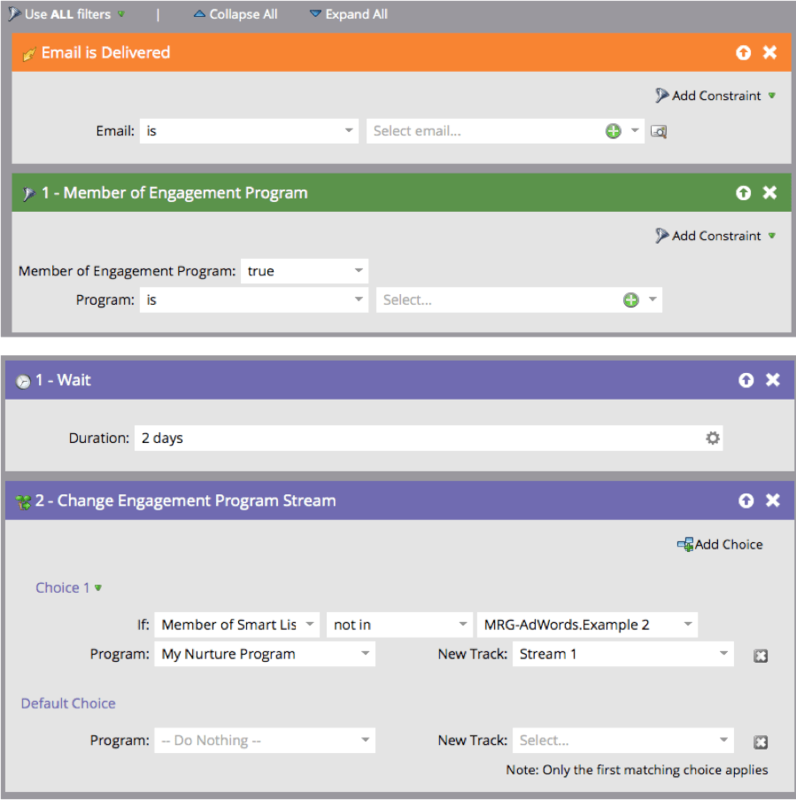 Clarifying question: Taking the Member of Smart List or Memeber of Program as an example, when using the “not in” value, does the filter still require leads to be in another program or smart list in order to qualify? In other words, can you not be in a smart list or program at all in the instance and still qualify? It seems like the filter is saying Member of Program, _but not any of these_, implying you may still need to be a program or smart list member somewhere to qualify. If you say Member of Program = False, NOT In XYZ Programs, it’s going to return specific people that are NOT members of those programs. I’ve seen that also cause some issues in situations. No, it should not require a lead to be a member of any program.